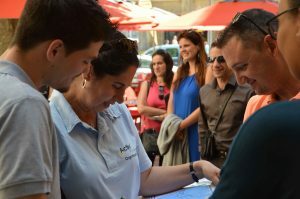 Activprovence / Blog / Incentive vs Teambuilding: which one to pick? Improving cohesion, communication, trust in one another and team spirit to work more efficiently together are the main goals pursued within Teambuilding activities. One could say the same about sports and that’s why they make such a successful combo. So, feel free to invite your Colleagues or Top Clients to active fun activities! Sport: key success factor to strengthen team cohesion! Both Sport & Teambuilding require few universal values: fair play, sense of organization, fellowship and respect. To develop and strengthen team spirit, choose Incentive and Team Building sports! With a range of adventure water sports and on land sports for your Incentives on one side, challenges and team sports for your Team Buildings on the other side, a wide choice is provided. Each sport activity will allow you to achieve your goals. It’s Summer time! Imagine yourself as part of the outstanding Oracle Team and replay the final of the America’s Cup on board of a fine sailing boat! Take place in a kayak and feel like Tony Estanguet, the French Olympic champion slalom canoeist, exploring the exquisite Calanques of Marseille! Ride down the Sainte-Victoire Mountain like Kathy Curd on her mountain bike! Summer offers a wide range of water activities such as Sailing regatta, dinghy treasure hunts, sea-kayaking coastal exploration, jet-ski experience. You’ve already practiced water sports and looking for alternatives? For sure, you’ll find great activities on land that are also an excellent way to amaze your Guests. 4×4 Quadbiking, climbing initiation, karting challenge on fast track, or even tactical and accessible petanque game. Sport as an Incentive will highlight the message of your Business. Pick Sport for your Team Building community challenges! The “Challenge” factor comes with most of the Team Building activities proposed by Activ Provence Event & Travel. Individual as well as collective achievement are the best way to inspire your working Teams. Through a selection of physical activities conducted as micro-competitions, participants will put all their skills forward (we always mind to keep activities accessible and enjoyable to all). These kind of competitions are fair and led in true good atmosphere by our staff in order to reach the optimum teambuilding results. Multi-activities challenge combines Team Building spirit and variety of skills. At the end, shorts debriefings allow participants to share their perceptions and learn from the experience. Sport activities such as our Olympics games are a great way to work as a team in a great mood and research of well-being! Feel free to discover new sports and go for active Business trips!